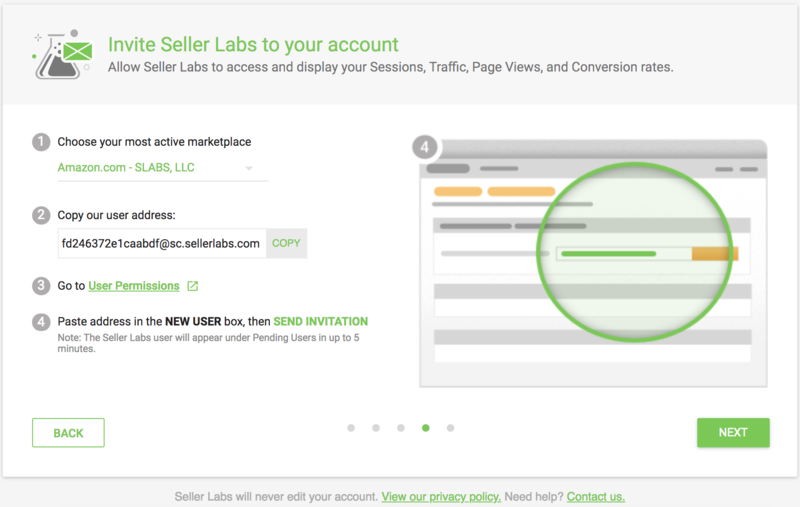 A step-by-step guide to granting special user permissions for Seller Labs from within Amazon's Seller Central platform. You can find that we've broken the instructions down into two separate parts, for clarity. -From your Seller Central Account's User Permissions page, add the email address provided in your account (i.e., "EXAMPLE@sc.sellerlabs.com"), and click "Send invitation". Amazon will send our system an invitation via email, and you will receive an email response from Feedback Genius with your confirmation code. However, this is only to notify you it is complete and you will not need this email nor the code. -From this screen, click on "Add User Permissions". -All of the permissions should be set to "None" by default. Select "View" permissions for Manage Orders found under the Orders section. -Next, find the Reports section. Select "View & Edit" permissions for Business Reports, Sales Summary and "View" permissions for Feedback. -After selecting those three options, click the "Continue" button at the bottom of the page. Once those steps are completed, the system will start to request the additional details needed for your account to begin working as expected. This can take a 24-48 hours to fully complete. Please note: This feature is only supported for trialing users and paid monthly subscription accounts. ❓Why do I have to complete this step? Feedback-based filters such as "skip if feedback has been left"